Keeping a list of your home inventory can be a beneficial thing to do. Reasons that come to mind are for insurance purposes, for keeping a track history of items that have been purchased or just as a inventory list for specific collectible items. Free Home Inventory Software is a freeware that has been designed for that purpose. It allows the user to track, organize and catalogue items. While it has been primarily been designed for home usage, it can as easily be used as a inventory management software for small businesses and organizations. Keeping track of your home inventory can be an important step in organizing and protecting yourself. Knowing what your assets are, having record of them, and some detailed descriptions can help you in recovering them as well as getting compensated for them by your insurance in certain cases. The inventory software uses manager files that store the inventory lists. It is possible to create and maintain multiple manager files. Each manager file consists of one or multiple inventory lists. The example manager file that ships with the application contains inventory lists for Electronics, Furniture, Jewelry and a test category. These are just examples and it is up to the user to create those inventory groups. Groups are automatically created when items are added. The program compares the selected category with the existing groups and will add the category to the inventory listing if it does not exist. 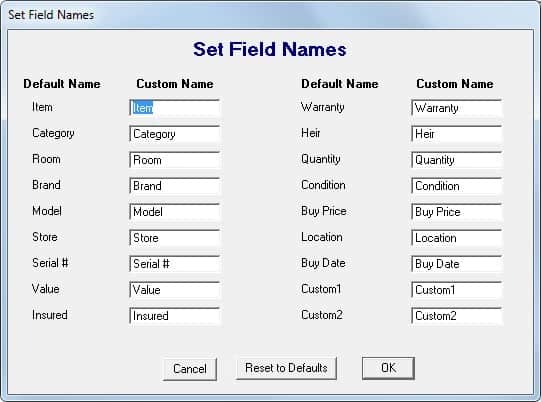 Custom fields are used to add item information to the inventory. 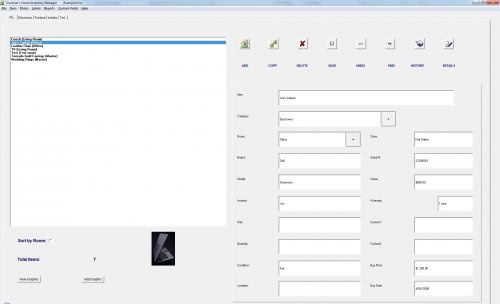 The program is quite flexible in this regard, offering the user options to customize all fields. Among the default fields are the category, room, model and serial number, value and store, if it is insured, the quantity, heir, warranty and buy date. Custom fields and naming changes become available immediately in the application. New items are added via the right sidebar. All descriptive fields are displayed in the sidebar and it is up to the user to fill them out accordingly. Most fields are optional, it is for instance enough to enter a name and category for the item to add it to the inventory list. A photo can be added for each item which may be helpful to identify items and for insurance claims. Data of a selected inventory item can be changed on the fly by editing the sidebar items. There is also an option to open a details form, which acts independently from the other form fields. This acts more or less like a personal description for that specific item. The inventory listing itself can be sorted by category (e.g. DVDs, electronics, valuables) or room. Reports can be generated sorted by a one of the available fields. The inventory software has a few quirks that need to be mentioned. Probably the biggest one is the interface and program window. The program window has a fixed minimum size with no option to reduce the size beyond that limit (it seems to have taken roughly two thirds of the 1920x1280 display on the test system). The interface elements do not change their size when the window gets resized. Even worse is the fact that there is no scroll bar available to access items that are not displayed when the program window size is reduced. The program could use an interface update to remove those restrictions. It would also be nice if the developer would add an option to load multiple photos of an item in the software, and integrate bar code / online shops to make the importing of items in the inventory software easier. Home Inventory Software is nevertheless a sophisticated inventory software for the Windows operating system. The program worked fine on our Windows 7 64-bit operating system, and should be compatible with other Microsoft OS' as well. A download is available at the developer website. Site download has gone offline. Can you post a mirror?